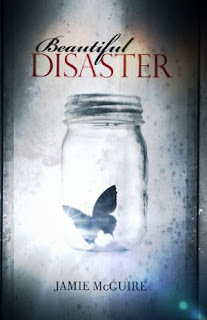 Beautiful Disaster is one confusing book. It is interesting and it really catches a reader's attention, yet sometimes it gets frustratingly annoying. It is a page-turner, but sometimes you just want the whole thing to blow up and end. The romance gets intense and sweet, but somehow you'll eventually tire yourself of the love/hate relationship. That's how beautifully disastrous my reading experience has been. I liked how the Abby's voice doesn't constantly remind readers that she had a bad past or that she's a troubled teenager. It was brought up quite a few times, but not to the point that everything revolves around or depends upon her past. The main focus of the book was Abby and Travis' love/hate relationship. They started off as friends, got to know each other better, then became best friends. But you can definitely sense the attraction between them. It was fast-paced, and I can safely say that the story started well. The annoying thing was the "getting together" part. Both of them got very confusing and the rest of their relationship almost always had complications that just seem to [I guess] insignificantly lengthen the book. Honestly, the story of their relationship felt a bit dragged because so many things are happening. There were so many problems tossed in one book. For instance, Parker, the Vegas thing, the trust issue and a lot more minor dilemmas. Also, I don't get Abby's personality. It's like Abby and Pidge are really two different people. The first one was a simple math geek who wears a pair glasses and cardigans. The other one was like a party girl who wears heels and drinks a lot. Travis wasn't as appealing as the book described him. Though he had his respectably sweet moments, he's actually quite irritating, especially when he instantly loses his temper and goes berserk.